Blade TV Series - The unofficial Blade: The Series fansite, with news, editorials, episode recaps, humor, and more. The unofficial fansite for the television show Blade: The Series. For those of you looking for a new show to follow you may want to check out TNT's new drama Falling Skies that will first air in June. I've just launched a fansite for it similar to this one where I'll be covering news, rumors, doing episode reviews, and more. If you're looking for reasons why to get excited for the show you can check out my article on the 5 reasons I'm excited for Falling Skies and see if any of those can help you decide whether or not the show interests you enough to tune in. Let's hope Falling Skies isn't cursed like Blade was. It'd definitely be nice to have a fansite for a show that lasts longer than one season. Jill Wagner was on Extra a few nights ago. In case you missed it, you can catch a bit of the interview right here. Sadly, there is no mention of Blade: The Series, but it's nice to see Jill is still in the spotlight and ready to make some waves in Hollywood. I was watching television the other day when I saw a commercial for ABC's new television series Wipeout. So what's that have to do with Blade? Well, everybody's favorite female vampire Jill Wagner is going to be co-hosting. The show appears to be similar to a few of those Japanese gameshows that have been increasing in popularity over here in the United States. The show premieres Tuesday, June 24 (8:00 - 9:00pm, ET) on ABC so if you need your Wagner fix, this may be your best bet. I've been a fan of similar japanese shows like Ninja Warrior and Most Extreme Elimination Challenge, so I'll probably give Wipeout a shot. I've just launched a new website called Blank Fill, where users can complete sentences with their own answers and see how they compare with the rest of the world. So what does that have to do with Blade: The Series? Well, today's topic is all about cancelled televisions shows, asking you which cancelled television show you will miss the most. Seeing as Blade: The Series is likely at the top of many of your lists, why not head on over and enter what cancelled show you will miss the most. The moment many of you have been waiting for, Blade The Series - The Complete Series boxset is now available! While it won't be including the second season we all wish would be made, it should be packed with some bonush features that may just keep you salivating over some vampire badassness. Also, keep in mind that there is a chance (albeit incredibly slim) that strong sales of the DVD may somehow bring back the show for a second season. I, personally, highly doubt it will happen... but I'd absolutely love it if you all could prove me wrong! If you do happen to pick up the complete series, do post some of your impressions below for your fellow Blade: The Series fans to drool over. The big question has finally been answered. 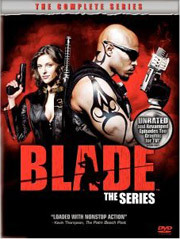 September 18, 2007 is the day the Blade television series will be released in DVD form as Blade: House of Chthon . The DVD will feature unbefore seen footage, commentary, and a making of featurette. Unfortunately this DVD is only the pilot of the show (the first two episodes), but hopefully this means the remaining episodoes will come out later this year. For those unable to wait until the full season is released, hopefully this starter will do for now. The latest poll results are in and the results are just what you'd expect. Which vampire house would you want to be in? With the House of Chthon being the main focus of the show, I don't think it comes as much of a surprise that most voters chose to join Marcus, Chase, and Krista. I, personally, voted for Leichen House because their mystery and interesting supernatural aspects intrigue me. The fact that they don't feed on humans is a big perk too! Thanks again to courtney for the poll suggestion and to all who voted! New Poll: Which vampire house would you want to be in? Last week I asked for some poll suggestions and Courtney submitted the question I'll be using this week "Which vampire house would you want to be in?" I'm giving four options for this poll, Chthon, Leichen, Armaya, and Erebus. There are a few other houses mentioned in the Blade universe, but these are the four that made an appearance in the television series. The House of Chthon was the featured vampire house, with , Krista, Macus Van Sciver, Chase, Charlotte, Thorne, and Fritz all being members. The House of Chthon is often referred to as being one of the most powerful (if not the most powerful) vampire house. The House of Leichen played a role early on in the series, but was soon forgotten. Frederick, Chase's ex husband (who's also the vampire that turned her), belongs to the House of Leichen. The house is very mysterious with the blood ritual that allows vampires to look into the minds of connected vampires. It's also known that Leichen vampires don't feed on humans, but rather cloned blood. The House of Armaya played a fairly large role - mostly due to it's pureblood leader Damek. Marcus' plans were constantly threatened by Damek. We also learned that it was Damek that murdered Marcus' wife and turned him. Damek was the main motivation behind all of Marcus' plans. From what is known, Damek was the last pureblood Armayan vampire, so with his death, they were likely to be left leaderless. The House of Erebus was the main vampire house for the first Blade movie. In the television show, the pureblood Alex was our own real connection to Erebus. There seemed to be some incredibly bad blood between the House of Erebus and the House of Chthon, though it was never fully disclosed as to why. So there are you're choices. Do you go with the powerful Chthon, the mysterious Leichen, the outcast Armayans, or the once proud Erebus? Thanks again to Courtney for the poll suggestion. Jill Wagner fans should be excited to hear that she'll be appearing in at least a couple episodes of Stargate Atlantis. I'm a fan of both Jill Wagner and Stargate Atlantis, so I'm definitely excited about this news. Wagner mentions that she's already filmed one episode and will be doing at least one more. Is there a recurring role in store for her? The article from Gateworld.net does say that her character is a leader of a new race and that this race will have a recurring part to play. Whether or not Wagner's character will be a part of that recurrence is another story. New Poll: What Poll Would You Like To See? Alright ladies and gentlemen, this week instead of me coming up with a poll and having you all vote on it, I'd like to hear everyone's suggestions on what I should do for the next poll. They should be at least somewhat related to this site and/or the show. They can be specific like asking about a particular scene in a certain episode, or they can be general like do you like the color pink. Even with all the polls I've put up, I'm sure there's some important question that you all would like to see polled, so here's your chance to suggest one. Put your suggestions in the comments below or use the contact form and I'll put them in the comments. Tuesday next week I'll pick the best one and put it up Thursday. If there's more than one great poll idea, I'll work the remaining in for subsequent weeks. The awesome Blade: The Series television show was sadly canceled, but this site will continue to bring you the latest news and information dealing with the Blade television show.